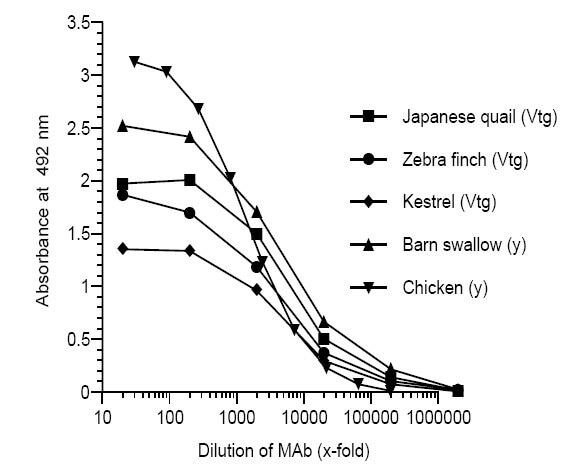 The monoclonal antibody ND-3C3 binds with high affinity to vitellogenin from Japanese quail (coturnix japonica), common tern (Sterna hirundo) and barn swallow (Hirundo rustica). The antibody also cross-reacts with vitellogenin from other bird species, including American kestrel (Falco sparverius), zebra finch (Taeniopygia guttata) and domestic chicken (Gallus gallus). The degree of cross-reactivity differs between species and with the methods employed. Mixture of Vitellogenin from Japanese quail (coturnix japonica), common tern (Sterna hirundo) and barn swallow (Hirundo rustica). Our Abpromise guarantee covers the use of ab36792 in the following tested applications. Vitellogenin (Vg) is an egg yolk precursor protein expressed solely in female fish and is dormant in male fish, but in the presence of estrogenic EDCs, male fish can express the Vg gene but in a dose dependent manner. The use of Vg gene expression in male fish can be used as a molecular marker of exposure to estrogenic Endocrine Disrupting Chemicals (EDCs). ab36792 has not yet been referenced specifically in any publications. Publishing research using ab36792? Please let us know so that we can cite the reference in this datasheet. There are currently no Customer reviews or Questions for ab36792.